Dartmoor Search and Rescue teams are helping some of the victims of flooding in York. 49 people have travelled up to Yorkshire, including swift water rescue technicians and water incident search managers. The teams have also taken a boat and eight 4x4 vehicles with them. 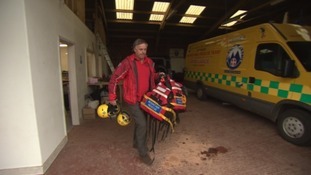 Alec Collyer from Dartmoor Rescue Group says it's about a making a difference. Dartmoor search and rescue aid flood victims in York. Roads and homes are under water in the region. Rescue teams from Exmoor, Cornwall and Dartmoor prepare to head north to help in the rescue operation in the north of England after "unprecedented" levels of flooding. Hundreds have been forced from their homes with York one of the worst hit areas with two dozen severe flood warnings, meaning there is a danger to life. Rising waters continue to overwhelm flood defences in Lancashire and Greater Manchester where a month's worth of rainfall fell in a day leaving thousands of homes were left without power. -CALLOUT- On the way to assist with the flood conditions in Yorkshire. 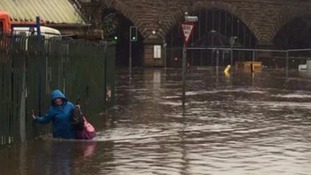 The Severn Area Rescue Association (SARA) Tewkesbury team is helping rescue people in Leeds city centre as flood water has damaged much of the area. The organisation which is one of the largest independent lifeboat service in the UK, second only to the RNLI, is doing all it can to help the flood effort. Crews are still in the south west should people need them. While our teams are in the North of the country helping those affected by the flooding we still have crew available at all our stations covering our local areas and rivers. Major works to help reduce flooding on the Somerset Levels are continuing to progress with four huge concrete culverts now in place. The culverts, which are part of the second phase of works at Beer Wall, each measure an impressive 2 metres tall by 3 metres wide and will allow any future flood water to pass under the A372. A stretch of the A372 was closed for several weeks in 2014 due to flooding and then to accommodate emergency pumping. The Beer Wall scheme being built is part of the multi-agency 20 Year Flood Action Plan which is now being overseen by the Somerset Rivers Authority. This is an important scheme to reduce the risk of future flooding and prevent the widespread disruption we witnessed back in 2014. I’m pleased to see it taking shape and know that a huge amount of work has been done already. We are of course disappointed that the completion date has changed but it is important that we get this project right first time. As we have said from the start, with a complex design and build scheme of this nature unfortunately we can never be completely sure how long work will take, even once work is underway. We apologise for the inconvenience for motorists and local communities keen to see this route reopened, but hope people understand how important this scheme is. Please be assured that we will be doing everything we can to complete this work as soon as possible. As well as keeping the A372 open, the three-stage Beer Wall scheme is designed to reduce flood risk in the Sowy and Kings Sedgemoor Drain river systems. Somerset's new community flood support boat needs a name - can you help? People in Somerset are being asked to come up with a name for the county's new community flood support boat. A similar vessel was a lifeline during last year's floods and, when it's not involved in rescues, it will be used by disabled people. The winner will get a chance to steer the boat themselves. People have until noon on Thursday 23 April to submit names to Somerset County Council, which will then be shortlisted for public vote. I think we can all agree that ‘community flood support boat’ is not a very catchy name! That’s why we’re appealing for your help in finding a new one. Let’s not forget what this boat represents. A similar vessel provided a lifeline to residents who had no other way of reaching their homes during the terrible floods of 2014. It transported everyone from schoolchildren and commuters to His Royal Highness The Prince of Wales. When it’s not being used as a rescue boat, this Wheelyboat is fully adapted for wheelchair use and will be used to help disabled people access the water. This is a boat for the community of Somerset, so it’s only right that the community gets to choose its name. So whether you’re a pupil at school, a local resident who was affected by the floods or just a member of the public with a really good idea, please get in touch and let us know what you think it should be called. West Beach in Dorset, which is featured in ITV's hit series Broadchurch, will be closed for up to six weeks while further flood defences are installed. The beach will have 7,000 tonnes of shingle placed on the sand to protect the sea wall. Work has been going on since October. Final preparations are being made for the official opening of the newly raised road into Muchelney. The road became an iconic image of the flooding on the Somerset Levels last winter - and the village of Muchelney was cut off. The road is one of several projects to prevent future flooding on the Somerset Levels - including dredging eight kilometres of the rivers Parrett and Tone.